Are you a Mad Hatter? 10 reasons to send a greeting card. Home / greeting cards / Are you a Mad Hatter? Are you a Mad Hatter? In this era of social media, texting and instant messaging, here are 10 reasons to pick up a pen, stick a stamp and send a card. The Mad Hatter may have had the right idea. It’s been a while since we last spoke, I’ve been busy and didn’t want you to think I had forgotten you. A handwritten card will forgive a lot more non-contact than a FB msg, take the extra minute to write a card. Your friend loves gardening and you saw this great card they’d love. Send it! Don’t just look and think “I know who’d appreciate that” because if you don’t send it they can’t appreciate it! It’s time for a coffee and cake somewhere. Your friend will feel you really want to meet up if you write a note, with even a time and place suggested….trust me, much more meaningful than a text and they’re less likely to forget a card and more likely to reply. Laughter is truly the best medicine and whether someone is ill, having a tough time or not that you know of, a humourous card will brighten up their day….just like it did yours when you picked the card. …we had that pyjama party years ago? Doesn’t the one on the left look like…. Happy Unbirthday! At least 364 days a year you can send these cards and let’s face it most of us would love more than one birthday a year. 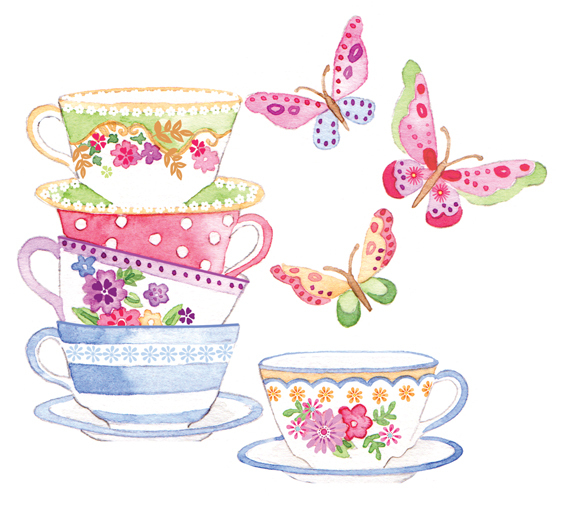 Or if you really are a Mad Hatter and love tea, then I have the perfect card! Whether it’s been a year since you walked along that beach or since they lost a loved one, such a thought will either bring back happy memories or remind them they aren’t forgotten in their grief. With many hospital wards not allowing flowers any more a colourful card goes a long way to brightening up the hospital bedside cabinet! If none of the above apply, well then just because it’s a thoughtful thing to do. Pick the right greeting card and it will look good and do good! Go on, make someone smile today, send a card. To stock up on cards visit my UK shop, if you’re outside the UK, visit International Enquiries to find out how to get hold of some fabulous greetings cards. Previous post: Watch “L309 Butterfly Baskets” on YouTube!